So when I woke up this morning, and I saw from my bedroom window, that it’s raining outside then no 2nd thought came into my mind except cooking Khichuri for us. The happiness was double as I had some Hilsa in my freezer. So it was a blissful lunch with Bhuni khichuri, some papad, fried hot Hilsa pieces and with a dollop of my homemade mango pickle. 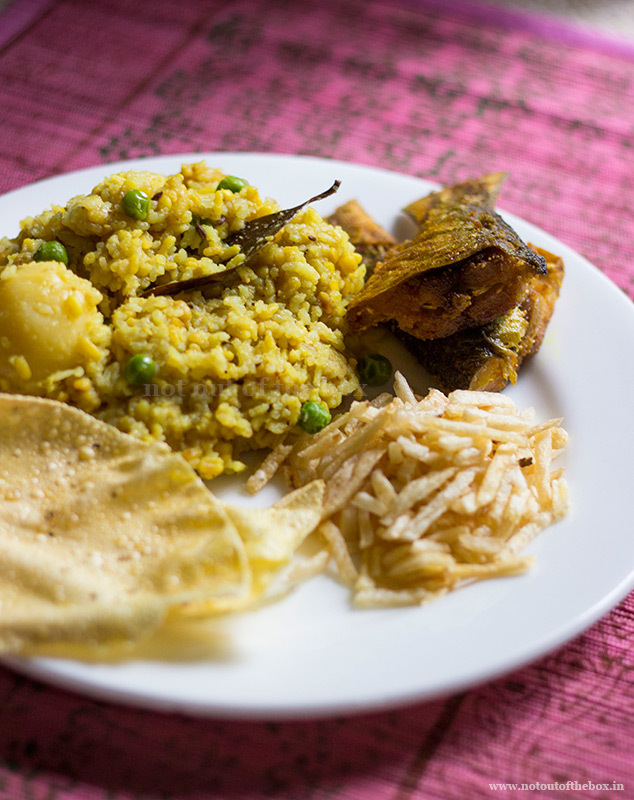 This version of Khichuri is little different than the usual Gobindobhog Chal er Khichuri. This has garlic into it followed by some other spices which makes it much more delicious than our regular onion-garlic free Khichuri. Some people add onion into this. But I don’t like onion in my Bhuni Khichuri, it’s a personal preference though. A good version of Bhuni Khichuri should be little bit dry with the visible grains of dal and rice. I’m sharing my version here, hope you will love it! Peel the potatoes, and cut into two equal halves horizontally. Wash and keep aside. Take a pan, dry fry the moong dal on medium flame until lightly golden brown in colour. Care should be taken not to burn the dal, stir continuously. Remove from heat. Wash the dal and keep aside. In a deep bottomed pan put the washed rice, dal, water, salt, potatoes, green chillies and 1tsp oil. Let the rice and dal cook together. When it is half cooked, take another pan and add 2 tbsp oil. Temper with dry red chillies, bay leaves and cumin seeds. Add ginger garlic paste, turmeric powder, cumin powder and coriander powder into this. Mix and stir fry for a minute. Add this masala and peas into the khichuri and mix well. Check to see if the water is sufficient to boil the rice and dal. If required you can add more water, but don’t overdo with the water part because this khichuri is supposed to be dry not watery. Now check after 10-12 minutes, the grains of rice and dal should be firm but at the same time it should get mashed when pressed. Add ghee, sugar and garam masala. Mix and cook for 2-3 minutes more. Remove from heat. Keep it covered after cooking to get the nice aroma when you are going to have this. Serve hot with Beguni, fried fish, papad, omelette, crisp fried potatoes whatever you like. If Gobindobhog rice is not available, then basmati rice can be used for this. But I recommend Gobindobhog rice for this khichuri. You can cook this khichuri with mutton keema. You can add medium sized sautéed cauliflower florets into this. Peanuts, raisins or cashews can also be added. 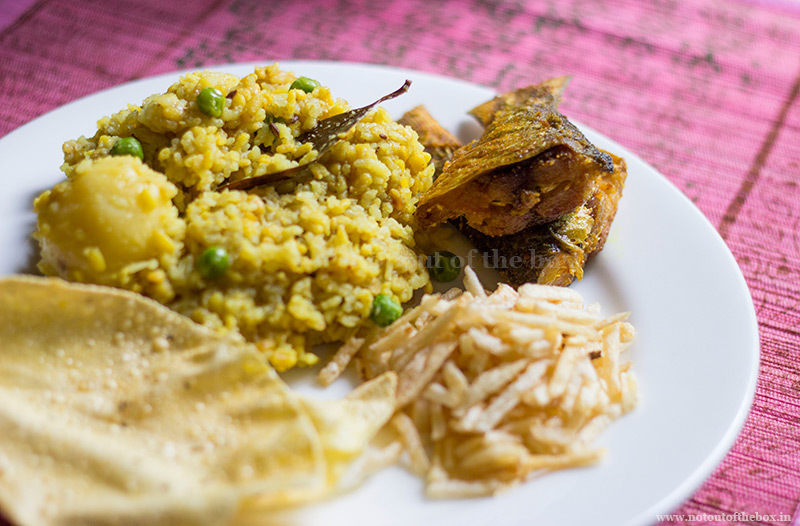 I had one version of Bhuni Khichuri where some grated coconut added at the end of the cooking. It was awesome. If you want, you can try that too. 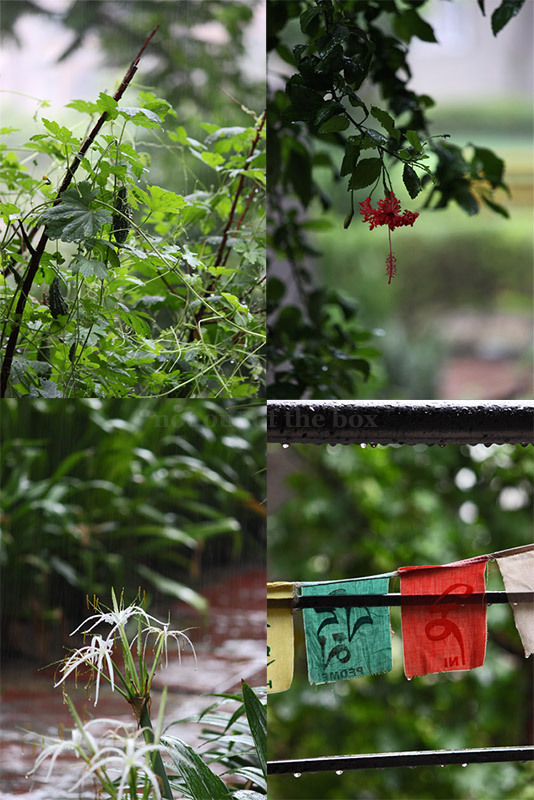 Glimpse of a Rainy Day!